Shuga Records, which calls itself Chicago's largest online record store, specializes in hard-to-find vinyl releases. WICKER PARK — With the addition of a third record store specializing in vinyl, Wicker Park is becoming the city's grooviest neighborhood. Shuga Records, a North Lawndale-based record store that sees many of its online sales from customers in the Wicker Park area, is setting up shop at 1272 N. Milwaukee Ave., joining the expanding Reckless Records and Dusty Groove. "We deliver to Wicker Park on a regular basis and have spent over three years trying to find a space on Milwaukee Avenue," said Shuga Records' owner Adam Rosen. At first, Shuga Records plans to open in October by appointment only for shoppers who "just want to dig through the bins," Rosen said. If all goes as planned, Shuga will be open to the general public by the holidays, he said. Shuga Records, which specializes in rare and hard-to-find vinyl, bills itself as Chicago's largest online record store. Located in the former Diana Shoes building, Shuga Records' 2,800-square-foot storefront will be in a vintage building next to the new 826CHI headquarters, a nonprofit group that closed its tutoring center and retail shop last month and plans to reopen next week at 1276 N. Milwaukee Ave.
Shuga Records will pack in close to 250,000 titles and have "four to five times what any records stores of the same size have," Rosen said. 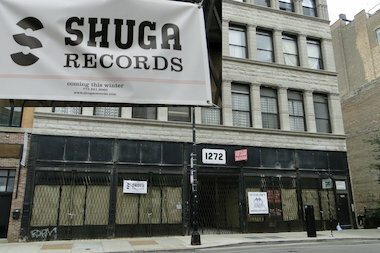 Shuga Records' entry into the area will come around the same time as the Reckless Records expansion at 1379 N. Milwaukee Ave. in the former Dollar Buster store. On Monday, Reckless Records owner Charles Taylor said that Reckless' new two-story shop, which will have space for in-store performances, hopes to open in November. And for at least "a while," Taylor said that Reckless Records will also keep its existing storefront at 1532 N. Milwaukee Ave., making three record shops within a two-block stretch. Rosen said he believes his shop's proximity to the new Reckless Records store will be a boon for the area. "We will be one block away from the new Reckless and two blocks away from Dusty Groove [at 1120 N. Ashland] and want to make Wicker Park a destination of where to go for records," Rosen said. Presently at 4115 W. Ogden Ave., Shuga Records currently offers free delivery for orders over $100 and counts as regular shoppers people who live in Wicker Park, Humboldt Park and Avondale, Rosen said. Rosen said the name Shuga Records evolved out of a DJ nickname, Adam "Shuga Rose" Rosen that he used several years ago. Geoff Vennette, a sales clerk at Decibel Audio, a shop that sells audio equipment and turntables at 1429 N. Milwaukee Ave, welcomed the news. "We sell tons of turntables here and to a lot of people that live here [in Wicker Park]," Vennette said. Vennette said that some people even buy a record before they shop for a turntable. When asked which records people buy before purchasing a system to play them on, Vennette said, The Clash's "London Calling," Fleetwood Mac's "Rumours" and "anything by The Beatles."